Technics explains what's so good about the SL-1200G turntable | What Hi-Fi? Let this Technics video try to convince you to buy the new SL-1200G turntable. The new Technics SL-1200G turntable should finally go on sale later this month. 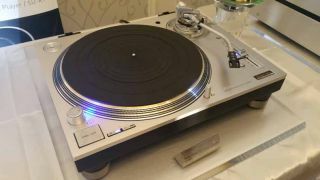 After first revealing plans for a new Technics SL turntable around this time last year, Technics has spent most of the year attempting to explain the price tag of the SL-1200G, which at £2,799, is more expensive than most anticipated. Now you can get what is probably the most thorough explanation so far, thanks to a video released by Technics. The video focuses on the build, design and materials, which together, Technics claims, will help deliver a level of sound quality that more than merits the price tag.